Ibiza's own Vermutería, Ajo Blanco. 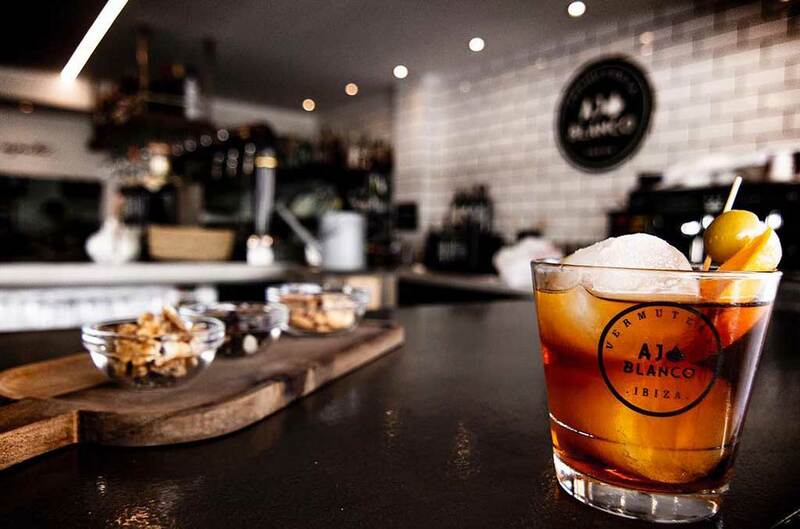 Who knew Vermouth could be so cool? At this time of year we are busy talking to many of Ibiza’s restaurants, bars and eateries. We are looking at their menus, promotions and direction, and the feedback from their customers and wider movements in the market. Using that insight, these are our predictions for Ibiza’s food and drink sector going forward. Restaurant website search terms, reviews on Tripadvisor, Facebook and Google, press releases in our inbox, and the owners of dynamic and innovative restaurants. They are all speaking with one voice on this – produce, produce, produce. People want to know what they are eating, where, when and how it was produced. Not to be confused with demand for organic or non genetically modified foods which are both demands in their own right but for smaller ratios of the public. The ever increasing expectation we are referring to here applies across the board from committed carnivores to vociferous vegans. Some may be coming at it from an angle of the best flavour, and for others issues of humane conditions or minimal environmental footprint, but they both join in creating an environment where restaurants are increasingly focused on what produce goes into their kitchen and out on a plate. One practical consequence of this is shorter menus. If a restaurant is going to use fresh local produce and avoid processed and frozen foods, the 100 item menu is impossible. Shorter menus with restaurants focused on a showcase of their culinary talents using the very best, and often local, ingredients – we think that has to be a good thing. Part of the focus on produce are various sub groups. By far the biggest of these is the surge in Vegan and Vegetarian offerings with many restaurants realising the importance of offering something more than the obligatory pasta and sauce afterthought for their non-meat eating patrons. Notably every one of Tripadvisor’s top ten restaurants in Ibiza includes vegan food prominently in their key features. The most progressive restaurants also realise the importance of other dietary preferences and needs, including gluten and dairy free, though perhaps surprisingly we are yet to see any restaurant catering specifically to diabetic customers. Tell us if you know different. As a further specialisation of the produce piece above, some restaurants are choosing to take advantage of the marketing benefits and often associated government support of using local produce under various protection certifications. We reported last week on the new extended labelling of Peix Nostrum, fish caught by local fleets, and penalties for restaurants claiming their produce to be local if it was not. There are similar schemes in place for other local produce from Almonds to Sobrasada, along with a new initiative to reintroduce varieties of native Ibicenco vegetables. The days of opening an uber-chic lounge and watching the money roll in are over, if they ever existed at all. Though the expansion of CBBC and ongoing success of many in the high end lounge and beach club sector may indicate a booming market, the reality is that many have found it a difficult sector to crack, leading to some broken dreams along the way. CBBC, Blue Marlin, Ocean Beach Club and others are successful because they know their market and they serve it very well. When a beach club with the kudos of Cathy Guetta’s name behind it can’t make a go of things, it should serve as a warning to independent venues that it takes more than fancy sunbeds and fit as a fiddle servers to make a go of things. But still they come, pockets full of cash made in markets they understand in their native land, to find out how quickly it can all be spent in an unforgiving Ibiza season. You do get a knack for sensing these things in our job, and we can bet with a fair degree of accuracy who will and won’t be here the following year. In; the people who will be successful are small, specialist enterprises with a clear vision and identity backed by passionate and hands on owners. Out; the people who will find it way tougher than they imagined are large lounge settings with muddled and fussy menus and owners basing their Ibiza business decision on their enjoyment of Ibiza holidays. If any newcomer has an attitude of ‘we’re going to do business properly’ (i.e. differently to Ibiza’s established ways) combined with their involvement in business operations limited to being propped at the bar or entertaining cronies, we think that however glam the surroundings, the staff should be concerned for their next pay packet. Our tip for the tipple for two thousand and nineteen, or if not this year certainly next. Most of us think of vermouth as that half consumed bottle of Cinzano that has been in our drinks cupboard since aunt Mary came at Christmas 5 years ago. But mumbling Martinis, it turns out there is an artisan Vermouth sector taking hold in the cooler districts of Spanish cities including Barcelona and Valencia. Known as Vermuterias, the vermouth bars are said to be typically small and offer pintxos alongside their special vermouths. Ibiza has its own, and at Tripadvisor’s number 4 restaurant in Ibiza, Vermuteria Ajo Blanco is proving a hit. We’ve also noticed specialist premium vermouths from big brands Martini and Cinzano on the shelves of trendier wine bars, and artisan vermouth articles in every broadsheet weekend supplement. And if we are doing vermouth adverts, we can’t leave out the classic Cinzano ad featuring Leonard Rossiter and Joan Collins. 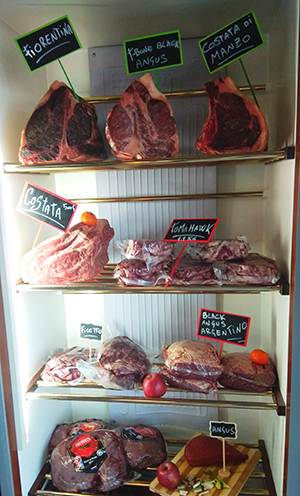 A specific trait of the produce point, we are seeing more and more specialist meat chillers on display in public areas of grill restaurants. With all due apology to those who would find such a celebration of flesh distasteful, but who knew meat could look so good? The quality of this phone image doesn’t do it justice, but this San Antonio grill has some cuts or types new to us. Cut of the season has to be the huge Tomahawk steak. It seems that the big Spanish brewers have cottoned on to the public interest in artisan beers and are looking to exploit it with their own branded premium brews. 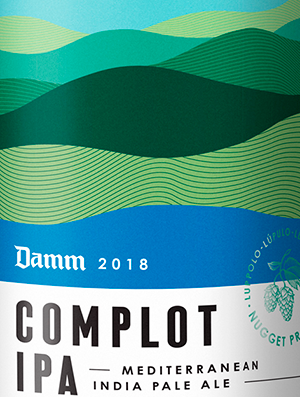 This 6.6% volume Complot IPA by Damm is an increasingly common sight alongside Estrella pumps, and with bars asking almost double the price of their standard lager, the brewers must think there is money to be made. As to whether anything in the production or manufacture of the premium ale actually justifies its price tag, we’re doubtful. Surely one mixture of chemicals sugar and water should cost about the same as another? The rebranding of cider a few years back was hugely successful. It will be interesting to see if the Spanish brewers attempts with beer reap the same rewards. On another note, a 6.6% draught beer does seem rather at odds with all attempts being made to curb problems of tourist drunkenness. It is like saying ‘You can’t drink after 3 in the morning any more, but don’t worry, we’ve got a draught beer that will get you fighting drunk by midnight’. According to the Good Pub Guide, the average price of a pint in London is £4.08, surely no coincidence that this is almost exactly the same amount as the 4.75€ the Spanish IPA costs in our local. So to our British visitors the price will not reveal its strength, and though it is shown on the pump itself, it is not prominent nor indicated in the branding – which if anything presents an image of pleasant rural innocence. If punters assume it to be a typical commercial pump strength beer, e.g. John Smiths is 3.6%, we’re sure it’s going to catch a good few people out who find themselves inexplicably inebriated after a couple of pints. Most blokes (sorry, but it is blokes) I know agree that drinking one pint of 6.6% beer has far more affect than drinking two pints of 3.3% beer. I don’t know if there is any science to this it just is what it is. So in a situation where somebody has two pints that might normally be no more than casual social drinking, this super-ale will have them feeling as if they’ve drunk 6 or more and thrashing about like a whirling dervish fulfilling every negative stereotype of a British tourist abroad. On the other hand it does taste nice. Battle of the Sexes – Time for Sport to Practice What it Preaches? Editorial: Christmas Things, Interesting Things, Statistical Things, Newspaper Things & Ibiza Things.